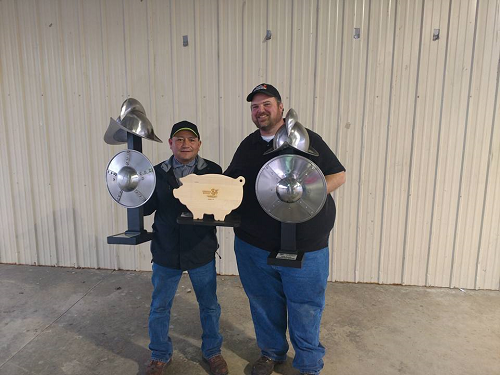 Congratulations to SmokeMasters on their Grand Champion with Whole Hog at this years Conquistador Challenge held on March 9th -10th as part of Esperanza Bonanza. Esperanza Bonanza is a non-profit, all-volunteer organization that is responsible for planning and organizing the yearly festival. In addition to the festival, Esperanza Bonanza also gives back to the community and local charities, causes, and projects. Esperanza Bonanza might be held in Marion, AR but it is truly a festival for the surrounding towns, counties, and states. When the board gives back to the community through scholarships, donations, and numerous other thing things they don’t limit that good fortune to just the city limits. Among the ways we give back, they offers grant opportunities to other local non-profit organizations, and in 2015 distributed $42,000.00 to these groups on top of the annual $5,000 donation that’s made to the Marion Chamber of Commerce. There is also a scholarship program to assist area graduating high school students, and we have aided the local fire department and emergency response services in funding over the years.